Sarah Nader- snader@shawmedia.com A red-tailed hawk flies to a nearby tree after being released at Glacial Park in Ringwood Wednesday, December 3, 2014. The hawk was recovering from a fractured left wing and injured toes after colliding with an airplane at the Lake in the Hills Airport in August. After a 14-week recover period and confirmation that it could hunt for its own food, staff from the Wildlife Resource Center gave the go ahead for the hawk to be released into the wild. Sarah Nader- snader@shawmedia.com A red-tailed hawk moments before being released at Glacial Park in Ringwood Wednesday, December 3, 2014. The hawk was recovering from a fractured left wing and injured toes after colliding with an airplane at the Lake in the Hills Airport in August. 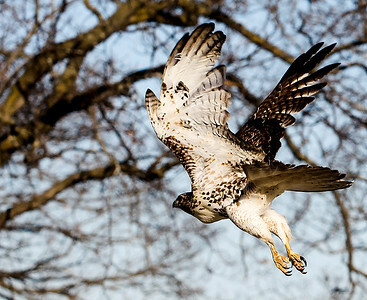 After a 14-week recover period and confirmation that it could hunt for its own food, staff from the Wildlife Resource Center gave the go ahead for the hawk to be released into the wild. 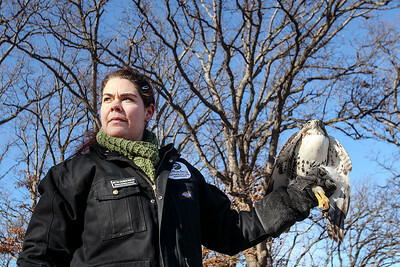 Sarah Nader- snader@shawmedia.com A red-tailed hawk moments before being released by Beth Gunderson, Wildlife Resource Center Specialist, at Glacial Park in Ringwood Wednesday, December 3, 2014. The hawk was recovering from a fractured left wing and injured toes after colliding with an airplane at the Lake in the Hills Airport in August. 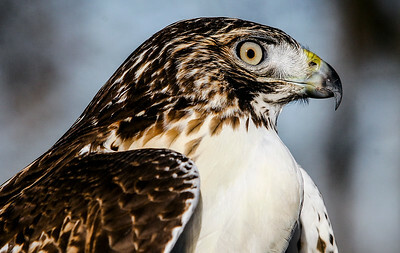 After a 14-week recover period and confirmation that it could hunt for its own food, staff from the Wildlife Resource Center gave the go ahead for the hawk to be released into the wild. 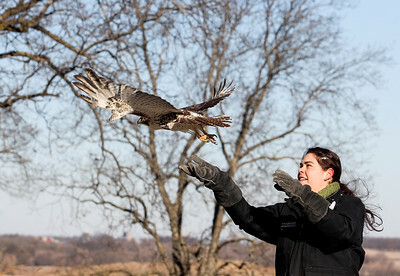 Sarah Nader- snader@shawmedia.com A red-tailed hawk is released by Beth Gunderson, Wildlife Resource Center Specialist, at Glacial Park in Ringwood Wednesday, December 3, 2014. The hawk was recovering from a fractured left wing and injured toes after colliding with an airplane at the Lake in the Hills Airport in August. After a 14-week recover period and confirmation that it could hunt for its own food, staff from the Wildlife Resource Center gave the go ahead for the hawk to be released into the wild. A red-tailed hawk moments before being released at Glacial Park in Ringwood Wednesday, December 3, 2014. The hawk was recovering from a fractured left wing and injured toes after colliding with an airplane at the Lake in the Hills Airport in August. After a 14-week recover period and confirmation that it could hunt for its own food, staff from the Wildlife Resource Center gave the go ahead for the hawk to be released into the wild.